Playing with Paper: A short break, and Merry Christmas! I made the tags, he wrapped the gifts. It works for us as I'm the sloppiest present-wrapper in existence! 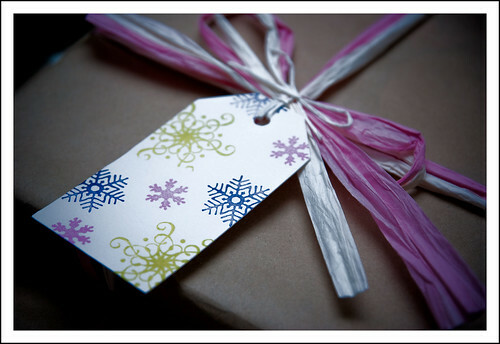 I used Colorbox Queue chalk inks (Christmas) on the tags that we used for our nieces' and nephew's gifts (as above) to make them bright and cheerful. The stamp set I used was "Winter Butterfly" by Hero Arts. Baking! We make these every year - they're Pebber Nodder biscuits, which are Danish apparently, and they are just delightful. Here's a recipe if you want to try them yourself! 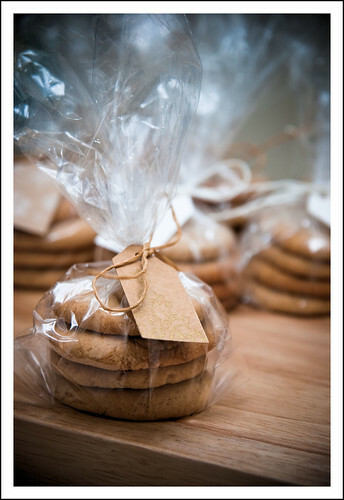 Once again, I made the tags, and my husband baked the biscuits. I was in charge of the presentation of these though as I'm the resident 'expert' raffia-bow-tyer! I used Versacolor 'Gold' on these little ones and stamped the top part of a Christmas tree from "Merriest Wishes" by Hero Arts. I find that the Versacolor metallic inks do not dry on most surfaces so I always seal with a matte fixative to stop it from rubbing off all over the place. I'll be back on Boxing Day though, to share next week's Sentimental Sundays challenge with you, I promise! In the meantime, check out the Sentimental Sundays blog to see the beautiful creations the DT has come up with for this week's theme - Inspired by Song - and play along yourself to have a chance to win beautiful Raindrop Echo Design digital stamps! Beautiful gift wrapping and photos Jess! Hope you have a wonderful Christmas. Well it's nice that you both have talents you can combine to get the job the done! the cookies look super yummy! Have a wonderful holiday jess! Jess, you're just like me! All the effort goes into the tag and not the wrapping for me too! Love the colour combo of those snowflakes - really funky and modern! Oh and don't even get me started on how yummy those treats look - delicious! Great tags! I love the fun colors you used. And those cookies look delish! I am glad you and your hubby have a chance to do these things together, it sounds like you have had fun! As for the peppernuts (pebernodder) those are one of my favorite cookies--my hubby is Danish so we are familiar with those. Have a wonderful Christmas! These all look just gorgeous! Perfect presentation. How sweet that you work together as such a great team. That is especially wonderful for the holidays.